Sanibel Island and the entire Fort Myers area is known as the shelling capital of the world. 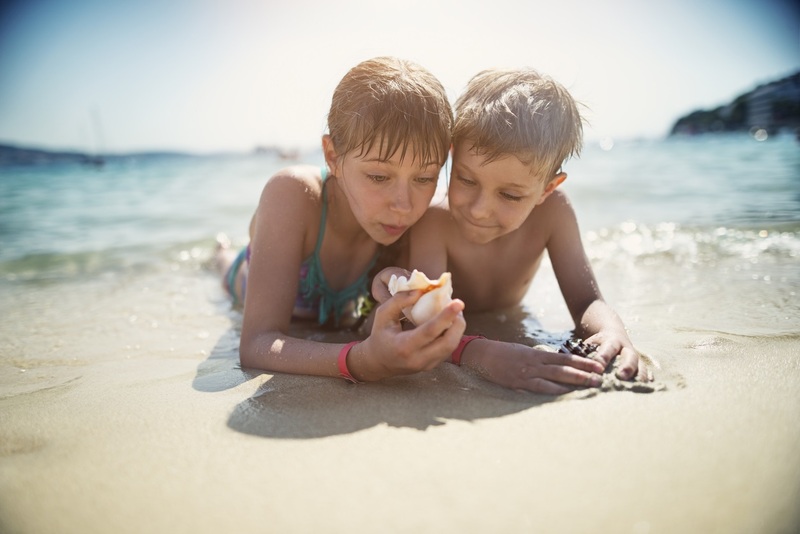 A shell haven for more than 250 species of shells, let us count nine reasons why shelling should become a pastime activity for you and your family. Are you a beachcomber that enjoys getting to the beach early to claim your spot for the day with a cup of coffee in your hands? When the tide is low, you can head to the Gulf waters with the kids and find a fresh batch of shells churned up for you courtesy of the Gulf of Mexico. Explain to the kids that the early bird scavengers find the best shells and they should be more willing to join you on the beach in the morning. Bonus Tip for Early Beach Risers: Before the sun rises and washes you out on the white sandy beaches, early morning hours are a great time to take some great family photos. Do your kids know what the Sanibel Stoop is? Do they know the difference between a conch and a turkey wing? Local fishing shops like Coastal Outfitters carry plenty of shell guides and souvenirs to get your kids interested in shelling and the names of shells. Make it fun and take them to the Bailey-Matthews National Shell Museum so they can become a shelling expert. Sanibel shelling is fun. So is searching for the elusive sand dollar. Seasoned shelling experts know there is nothing like the thrill of finding the sand dollar on the shores of Sanibel Island and Fort Myers. Sand dollars aren’t as easy to find as shells. Your kids will love learning about how to find them, so read our blog on how to find the sand dollar to make it easier for you. Shuffling your feet in the water slowly brings more shells into view. Have fun with your kids when you teach them that one of the best ways to find shells and sand dollars is to dance in the Gulf of Mexico. Standing in shallow water and shuffling your feet slowly brings more shells hiding under the sand into view. Find other tips in our blog about how to find perfect shells. At the end of the day as the sun sets, tell your kids it’s time to search for the Green Flash. Right as the sun sets below the Gulf of Mexico, keep your eyes peeled for a swirl of pink and orange that splashes across the water at the same time, making way for a brief green flash over the water’s horizon. It doesn’t happen every night but when you see it; your kids will have a great memory at the end of a fun shelling day. Once you and your kids have collected all your shells, have some fun with them. Have everyone spread them out on a beach towel and engage with each other as they do some shell trading. Once all of your kids are done trading their shells, it’s time to have some fun with the shells. Use the smaller shells your children found to make shell necklaces. You can also remember your shelling fun forever by filling mason jars with shells you can keep for placement in your home. Also try filling up an empty glass lamp with your Sanibel shells. We have nine reasons why Sanibel shelling should become an activity for your family. Enjoy some time on Sanibel Island and Fort Myers by staying for a while. Rent a fully furnished condo at Royal Shell Vacation Rentals or Sundial Beach Resorts & Spa. Sundial guests receive 30 percent off boat, canoe and kayak rentals. Complete your perfect adventure by renting a boat or scheduling a shelling charter excursion that takes you out on the outer islands for an adventure offered through our charter partners at Port Sanibel Marina. Utilizing a boat is a great way to spend the day while shelling and enjoying nature on Sanibel Island and Fort Myers. Give us a call at (239) 437-1660 to plan your boating needs today!